Teams presented before a panel of nationally-known judges and 600 attendees in the Dahnke Ballroom at the University of Notre Dame stadium. Daymond John, CEO of FUBU and co-star of ABC TV’s Emmy-Award winning series, “Shark Tank”; Matt Rogers, the inventor of the Nest thermostat and engineer on the original Apple iPhone; Swati Mylavarapu, founder of Incite Labs, partner at Incite Ventures and former partner at Kleiner Perkins Caufield and Byers; Dan Peate, alumnus, founder and general partner of Peate Ventures; Mark Foley, alumnus and managing director at RWI Ventures; and Tracy Graham, alumnus and founder and managing principal of Graham Allen Partners served as this year’s final round judges. This was also the first year where teams from the community could compete for prizes, with more than $100,000 being available to them. 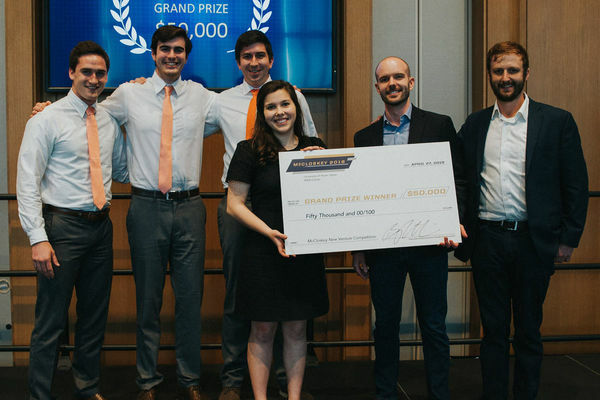 “Words simply cannot describe how pleased we are with the 2018 McCloskey New Venture Competition,” said Karen Slaggert, director of the McCloskey competition and director of student entrepreneurship at the IDEA Center. "We had incredible support from the Notre Dame community and our award sponsors. Feedback from those attending has also been incredibly positive. The energy and excitement in the room was palpable as our student, alumni and community ventures knocked the ball out of the park!" Following is a listing of the awardees; descriptions appear below. BlockUp is a unique, patented, fast-build construction block system. Its strength, durability, and flexibility are similar to concrete masonry, but the system differs in its fast, precise, and efficient assembly. This grouted system eliminates mortar, allowing for installation four times faster than a regular CMU wall. The BlockUp system will revolutionize masonry construction as it not only matches the performance of existing block at much lower cost, but also offers patented enhancements, such as improved reinforcement options, sheer resistance, and water management features. DermaDiagnosttics is a microneedle-mediated intradermal diagnostic patch that will detect asymptomatic STIs and gynecologic cancers is of utmost need in our rapidly evolving globalized world. To date, no immediate diagnosis or combined diagnosis-treatment option for gynecologic malignancies such as sexually transmitted infections (STIs) or gynecological cancers exists, leaving patients vulnerable to greater health risks. The physical, psychological and social consequences of sexual and reproductive health compromise rigorously the quality of life of those ill and at risk. Explore Interactive utilizes augmented reality technology to make learning seem like play. Our Explore! Cards© allow virtual objects to appear in the real world by utilizing the camera on your mobile device. Imagine creating electrical circuits, experimenting with dangerous chemicals, or inventing the next generation of solar panels: the possibilities are truly endless if we Explore. Figuro3D is group of entrepreneurs, hardware engineers, and programmers that believe capturing 3D images quickly leads to more innovative, more productive, and more meaningful work. Our mission is to make 3D scanning as quick and simple as taking a picture. Our team collaborated with the Digital Historical Architecture Research and Materials Analysis (DHARMA) to create digital 3D models of World Heritage Sites, such as the Roman Forum and the Taj Mahal. After realizing the positive impact fast 3D scanning can have in the world, we decided to form Figuro3D. Gigil is a subcutaneous injection-stabilizing device aimed to give individuals with autoimmune diseases the confidence to effectively administer an injection without the aid of a nurse or professional. Its function is twofold: It ensures effective medicinal delivery through a guided and stabilized 45 degree angle injection pathway, thus providing peace of mind. Scar tissue buildup and bruising is decreased by offering the ability to rotate injection sites. Second, it mitigates pain through small bumps on the posterior side, saturating the nerves as the patient pinches the device during application. There is an opportunity for significant clinical innovation leveraging the power of social networking to increase engagement and motivate chronic disease patients to improve their behaviors. Healthy Points is the first secure digital networking-based population health management tool that can enhance a health system’s effectiveness at modifying patient behaviors and increasing patient self-management. At Indiana Lysis Technologies, LLC (ILT), we develop safer direct fibrinolytic agents to digest clinically-important blood clots utilizing novel multivalent nanoparticle delivery formulations. We are a product-based drug discovery company with core-competency in nanoparticle drug delivery seeking to commercialize a patent-pending clot dissolving technology. Our initial clinical indication is catheter-directed treatment of pulmonary embolism (PE). Pirouette Medical is developing and bringing to market a revolutionary auto-injector. There has been a steady rise in the number of allergy patients per year that require an epinephrine auto-injector (EAI). Currently, Mylan’s EpiPen has captured over 90% of that large and growing market. However, the EpiPen and other existing EAIs leave patients actively seeking an alternative to address the anxiety they feel associated with the five main pain points; poor portability, temperature susceptibility, unwanted attention, accidental injections, and lacerations. Pirouette Medical answers that call. Resonado is a consumer electronics manufacturing/tech firm specializing in innovative speaker technology called Flat Magnetic Speaker Technology (FMS). With its patented technology, Resonado reshapes the audio industry by revolutionizing the current 100-year old speaker technology and provides high quality speakers with the best sound-to-weight ratio only possible with FMS Technology and unrivaled by other competitor’s models. SalvePeds is an early-stage pharmaceutical company offering the novel drug ND-336 as a topical therapy for the treatment of diabetic foot ulcers (DFUs). Pre-clinical studies with ND-336 in diabetic animals have shown that this drug accelerates healing up to 200% over placebo-treated, and is 150% more efficacious than the only FDA-approved drug Regranex™. Our goal is to provide an effective, safe and convenient healing treatment for DFUs to prevent thousands of amputations. Currently, we have initiated IND-enabling studies and we plan on beginning phase I clinical trials in early 2019. SecῡrSpace is an online platform for booking parking and storage space for trucks, trailers, and shipping containers. Through the platform, storage yards can market available space, while warehouses, distribution centers, and other businesses with secure locations can list open lots and monetize underutilized property. SecῡrSpace provides a greater selection of parking and storage options for buyers, saving both time and money. Streetlight Creations is a custom music platform that creates songs and lyric videos which are paired together for the purpose of gift-giving. This can be used for a variety of occasions such as anniversaries, weddings, and birthdays. This platform provides customers with the opportunity to make beautiful music alongside talented artists, while also giving artists the opportunity to build their fan base and portfolio of music. Team ERS has patented technology around an electric-hydraulic hybrid system. This combination has many market uses such as: fork lifts, cranes (and other heavy construction equipment), elevators, grid scale energy storage, and others. We are initially targeting the vehicle market, specifically the commercial vehicle market. The commercial vehicle market is in serious need of alternatives to fossil fuels, which are currently inefficient and not marketable. We create an efficient system, with studies showing over 90% energy recapture for reuse. ThinkBig harnesses the power of data and AI to help non-profits to maximize their impact. Data and artificial intelligence are poised to transform business. As the CEO of MasterCard puts it, “data is the new oil”. We believe this technology should be used for more than profit. Our unique software solution integrates AI and data insights into fundraising, communication, volunteer management, client outcome tracking, and other necessary tasks for running a non-profit. ThinkBig saves time, turbocharges fundraising, and helps users wring the most good out of every dollar. Originally published by Nick Swisher at ideacenter.nd.edu on May 02, 2018.